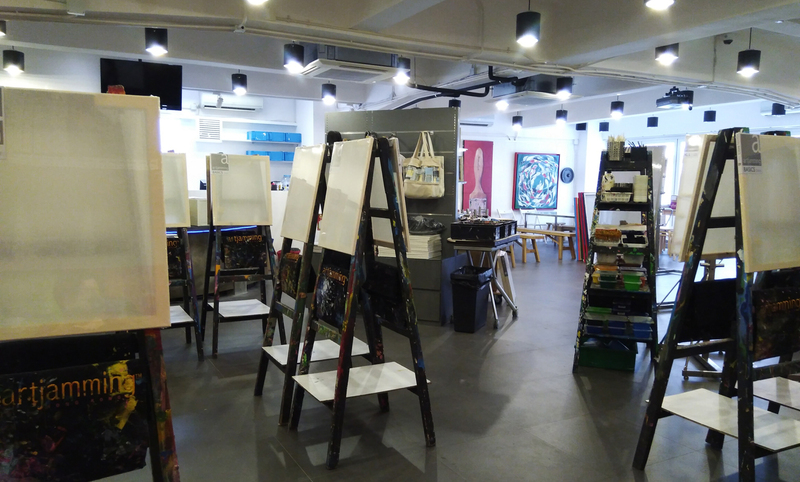 If you haven’t seen our Wong Chuk Hang studio, you’re missing out. Come join us on the south side. We are just 10 minutes away from Admiralty MTR and only 15 minutes away from Causeway Bay by car. There is 2000 sf of space for ART JAM® or private events plus a 1200 sf garden terrace to chill out. Our artjamming ™ studio features the original ART JAM® created by Betty Cheung. This is the place to be for the ultimate freestyle painting experience. A wide range of large, high quality thick-profiled canvasses with your choice of shapes and sizes and fabric combined with our one-of-a-kind free flow acrylic paint station, creativity just flows. artjamming™ accommodates 60-80 individual ART JAM® painters depending on canvasses chosen and the easel layout. For other events such as collaborative paintings, product launches, luncheons etc., the studio accommodates 100-140 people depending on furniture layout. We welcome your inquiries to hire the space for private or semi-private events. Below are the most common ways that visitors use to get to artjamming™. If you need more detailed information, please feel free to contact us and we’ll help you get here. Buses & minibuses are plentiful and frequent in the area. Many buses stop at the MTR, on Nam Long Shan Road or on Wong Chuk Hang Road near the Aberdeen Sports Ground. Most stops are only a few minutes walk from artjamming™. Cars, taxis, & private coaches may drop off on Yip Fat Street (short section) next to the SF Express. For the Chinese address for your driver, please see Chinese address. Car Parking at One Island South car park is recommended. There is also metered street parking spaces behind One Island South and on weekends, usually street parking is available. We welcome visitors to BYO refreshments. To faciliate clean up, we will add a small fee of $10/person for artjamming™ customers and/or their guests who consume their own food & drinks in the studio or on the garden terrace. Thanks for your understanding. To arrange a visit to help plan your event at artjamming™ please contact our team.